Simple. Professional. Affordable. Jabra PRO 920 is a professional entry-level wireless headset designed for use with desk phones. The robust Jabra PRO 920 offers all the essential features of a wireless headset in a simple design at an attractive price point. Greater productivity and comfort Jabra PRO 920 frees users from their desk, enabling them to find documents and multi-task with maximum efficiency while on a call. Apart from being able to walk and talk up to 120 m/325ft away from their desk, users will also benefit from enhanced ergonomics as the headset prevents neck strain caused by pressing a phone to their ear for long periods. True Jabra quality sound Jabra PRO 920 offers crystal clear audio and quality enhancing features such as Jabra SafeTone™ that protects hearing by cutting off loud noises and securing safe average sound levels. The noise-canceling microphone eliminates unwanted background noise from an office or call center environment. Easy to DEPLOY . Easy to use. Jabra PRO 920 is compatible with all leading desk phone systems. User-friendly voice prompts make set-up a breeze, and the simple and intuitive call-control buttons make it easy to control calls from the headset. Desk phone connectivity: Enjoy hands-free communication and increase productivity. DECT wireless technology: Voice dedicated transmission prevents interference from WI FI. Up to 325ft* office range: Increases productivity and comfort. Multitask with maximum efficiency and control your call from anywhere in the office. Talk time up to 8: hours Talk all day. No need to charge headset during working hours. Separate call-control button ensures intuitive call handling. Selectable auto sleep-mode function: Saves power when the headset is inactive for a longer period of time. Noise-canceling microphone: Enhances call clarity by eliminating background noise from an office or call center environment. Digital Signal Processing technology: Hear and be heard more clearly with digitally enhanced speech. Headset weight: 27g - Lightweight headset for all-day-comfort. Selectable range settings: Adjust range settings to optimize for high density environments. Minimal energy consumption with Jabra: IntelliPower system - Headset adjusts power consumption automatically and base unit is optimized for low power consumption. This saves energy and reduces carbon footprint. Standby time 36 hours: Reduces need to charge headset. Fast charge battery: The headset is fully charged in less than 3 hours. 50% charging in 50 minutes. 20% charging in 20 minutes. Voice prompt guide: Setting up your headset has never been easier. Users are guided through every step by voice prompts. Conference mode: Up to four Jabra PRO 920 headsets can be paired with one base to form a conference call. Battery status indicator: The battery icon on the base lets users know if the battery is charging and when battery power is low. Upgradeable software: Simply connect the service cable (optional) to the computer and update the unit via www.jabra.com/PC Suite. Security: encryption between headset and base - Secure conversation. Ensures that no one can listen in. Jabra SafeTone™ technologies: Protects your hearing by cutting off sound spikes and sudden loud noises (PeakStop™ protection) and securing safe average sound levels throughout the day (IntelliTone™). Remote call-control: Jabra’s Electronic Hook Switch adapters (EHS) enable users to answer, end or mute a call from the headset while away from the desk. EHS adapters are available as accessories. 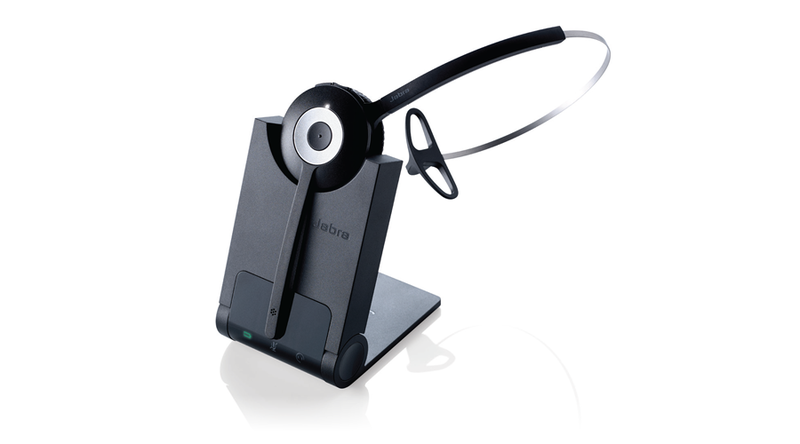 Compatibility: Jabra PRO 920 is compatible with all leading phone systems. One-year limited warranty: With GN Netcom’s no-fine-print 1-year warranty, users will enjoy worry-free ownership.